Aside from its religious significance, Easter is a holiday enjoyed by kids and grown-ups alike. Why not capitalise on the festivities by organising an Easter fundraiser? Using existing Easter traditions to make your fundraiser unique to this time of the year will create a buzz that brings the community together, while creating interest in and generating income for your group. As Easter falls differently each year, click here for a list of the official public holidays. Don’t set the date of your Easter fundraiser to coincide with these days, which are traditionally set aside for family celebrations, religious observation or holidays. Your fundraiser will almost certainly work better the weekend before. It's also worth nothing that ANZAC Day often falls directly after Easter, providing another opportunity for a fundraiser (a sausage sizzle, perhaps). Before you get started, you may also want to review other Funding Centre special event help sheets, such as planning and scheduling a special event. Local media – particularly local newspapers – are often looking for photo opportunities at Easter, so let them know the details of your fundraiser well in advance. Children with cute bunnies or colourful eggs make great photos and will provide your organisation with even better exposure. 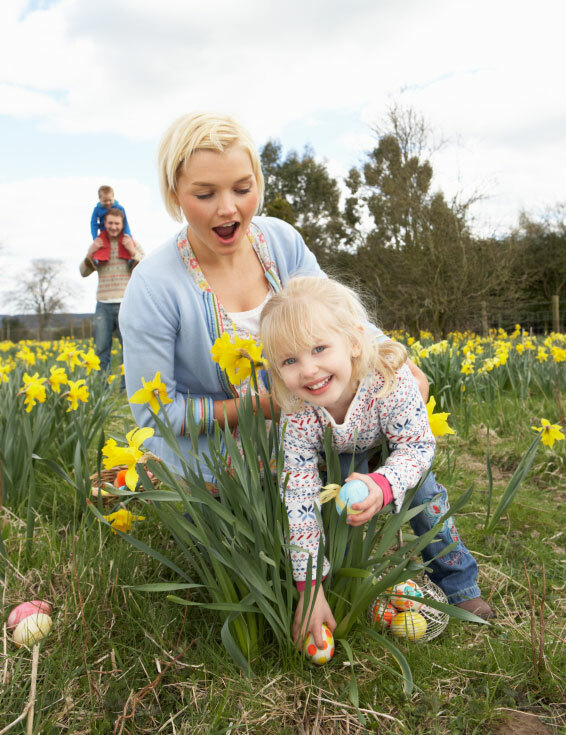 For a good Easter egg hunt you need a decent-sized venue – usually outdoors, such as your school grounds or a local park (even better if there is a wet-weather alternative nearby) – some small, good-quality Easter eggs and some time to hide them all. Invite families and children to take part, add some entertainment and ensure you have a contingency plan in case of inclement weather. Charge a small fee, such as a gold coin donation, for children to take part. You may also consider including major prizes, such as gift vouchers or movie tickets, in the hunt to provide extra incentive. You could charge more for entry, perhaps $5, to cover these costs and increase fundraising potential. You could also work other fundraising ideas into the hunt, such as raffles and refreshments. Easter hampers are popular, easy to prepare and provide something for the adults attending your fundraiser. They can be decorated and themed to include chocolates, seasonal produce, jams and preserves, tea, coffee and hot chocolate or baked goods. Once they are prepared they can be priced and either raffled or auctioned. Local retailers or market stallholders may be interested in providing donations. The traditional Easter bonnet parade is a fun and creative fundraiser for schools. Students can make their own bonnets at home or as a class activity and then show them off during a parade on the last day of school before holidays. Money raised comes from a gold coin donation to take part, perhaps with small prizes for the best, zaniest or most colourful bonnet. A stall can be staged as part of your own fundraising activities, or organised as part of one of the many local markets usually staged around Easter. Taking the trouble to develop an Easter theme for the stall should attract extra customers. Options might include selling homemade chocolates and hot cross buns (involve students in the baking process), or a craft sale with Easter-related gifts and decorations. You should also include an informational component to spread the word about your organisation and allow people to join as a member or sign up to your newsletter. Egg-related activities are not only fun, relatively easy to organise and in keeping with the theme of Easter, but also require very little in overheads which is vital to staging a successful fundraiser. Options include egg decorating, egg and spoon races, egg tapping, egg rolling or an Easter egg guessing competition. Some activities would raise money through a small entry free, while others, like egg decorating, could also see items sold later, included in fundraising hampers or used as raffle items. Groups who are fundraising can do worse than incorporating the Easter bunny (or bilby) in their activities. Consider holding a set price pre-Easter luncheon with raffles, presents and an appearance by the Easter bunny, with photo opportunities for children at a small cost. You could also add another dimension to this by hiring (or borrowing) some real life pet rabbits for the children to hold. The good old fashioned barbecue remains a great fundraising option. Depending on your resources and ability to stage a fundraiser, your group can either hold a sausage sizzle as an add-on to an existing event you are running or as part of another larger event like an Easter market. You might even wish to approach your local RSL and offer to organise a sausage sizzle on ANZAC Day, splitting the profits with them. Another easy-to-organise fundraiser is an Easter movie night or marathon. There are all sorts of movies closely or vaguely linked to Easter that could be shown. An alternative to this could be an Easter-themed trivia night. Bands, choirs, dancing groups and other local performance-based organisations can arrange either a stand-alone show or a performance during another one of your fundraising events. Easter is an ideal time to drop a line to members to thank them for their support, keep them informed of your efforts for the year so far and subtly ask them for further support. Staying in touch with members and supporters over Easter will also make it easier for you to contact them for donations later on. An email or specially designed e-card is a quick and inexpensive way of achieving this. If all else fails, identify a project or program that needs a boost and launch a fundraising campaign before Easter arrives. Work hard to sell your appeal, promote it strongly and ensure people can give easily while on holiday by using an online giving facility (such as GiveNow.com.au) and placing a highly visible ‘Donate Now’ button on your site. To really create a great fundraiser, choose at least two of the above fundraising ideas and combine them into a larger single event, such as an Easter fair. You will get much more participation and raise more money with a combination of offerings.